Now it’s EASY to create an awesome customized DIY project! Below are the various options we currently offer for customization. To make a custom DIY project, please register at least 4 days prior to the event. Select the Custom Project Registration option, then INCLUDE ALL INFORMATION WE WILL NEED TO PREPARE YOUR PROJECT (include name of project, last name for lettering, established date, specific wording, etc.) in the comments section. You can order a custom project for any of our DIY Project Party times, the cost is $47 for custom projects no matter which session you attend. If you want a custom design that you do not see here, please email us a visual to see if we can make something similar for you. Remember: ALL custom project requests we need FOUR days notice in order to have your custom stencil ready. 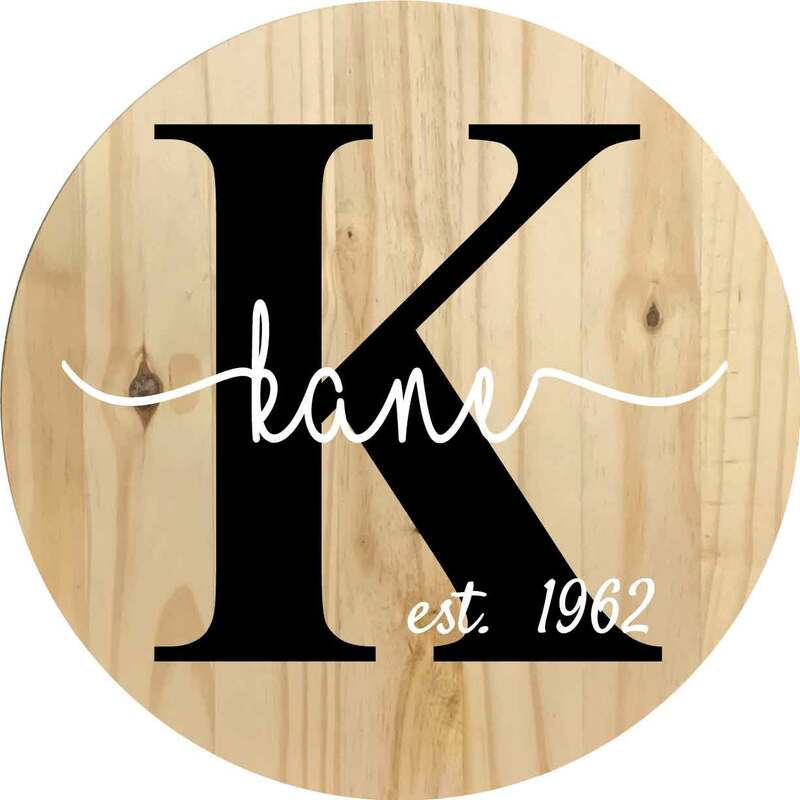 Create your own custom sign! 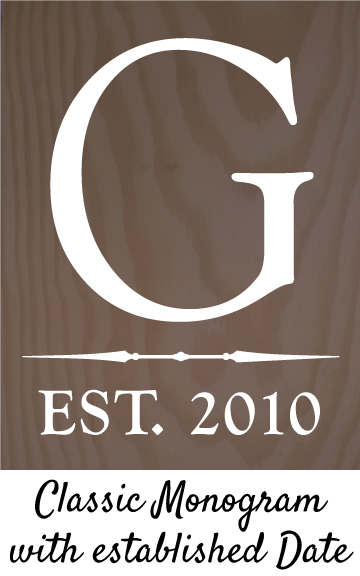 Custom Wood Signs – Make one for yourself, gift one to a friend. 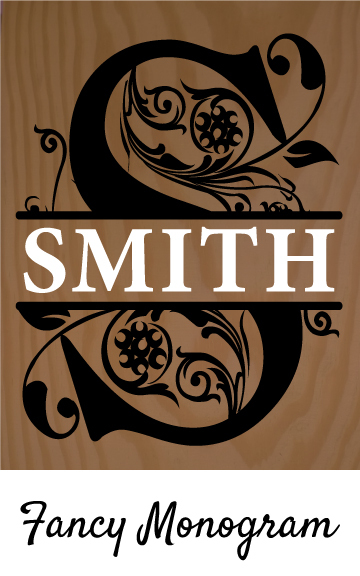 Decorate the wood and paint your lettering to complete your project. Let us know in the comments when you register the exact project and lettering you want to feature. Custom Centerpiece Box – These unique wood centerpiece boxes are sized 24″ long. Display on your mantle, table, virtually anywhere and change the décor seasonally. Decorate the wood and any way you like, paint your lettering then assemble your box to complete your project. Let us know in the comments section when you register the exact name you want to feature. Family Birthday Boards – Keep all those important dates organized and visible. Make one for yourself, but it also makes a truly one of a kind gift. 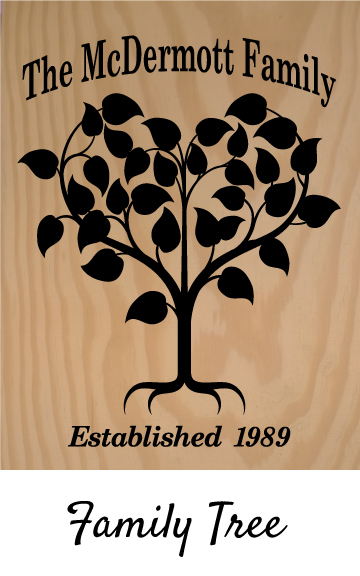 We’ll take the name you want to feature and create a custom stencil for you. All hardware is included. Decorate the wood and pegs any way you like, then paint your lettering to complete your project. Let us know in the comments when you register the exact name you want to feature. 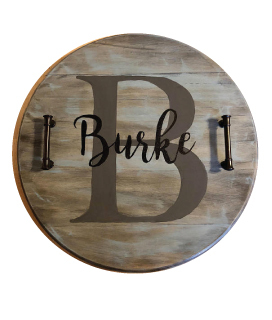 Customize your serving tray with Monogram & last name. 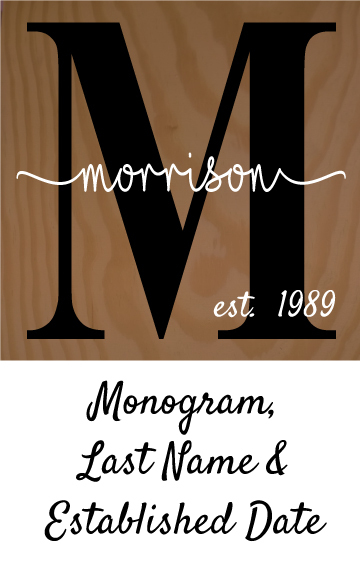 Decorate your Lazy Susan with Monogram, Last name & established date. 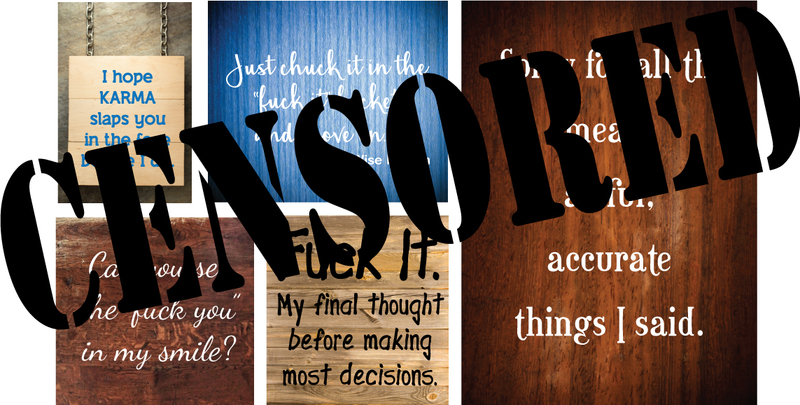 Create your own UNCENSORED custom wood sign. Snarky . . . comical . . . sarcastic . . . it’s all good. You tell us the phrase that you would like, we’ll create your custom stencil. We just ask that you keep your phrase to 12 words or less. We typically use 12 x 12 or 12 x 15 wood pieces. You decide what color to paint your wood and your lettering. Registration closes 4 days prior to party so we can create all your custom stencils. Want some custom uncensored sign ideas? String Art Names – Create a truly one of a kind gift. We’ll take the name you want to feature and create a nail template for you. Let us know in the comments the exact lettering you desire and also IF YOU WANT SCRIPT OR BLOCK LETTERING. Decorate the wood any way you like, hammer in your nails using the template as a guide, then add whatever color string(s) you want to complete your project. Coir Door Mats – These authentic 18″ x 30″ Coir (coconut) doormat with PVC backing are heavyweight, durable and functional. Your custom design will make it beautiful too! Choose from the lettering styles shown. Let us know in the comments section which design & the exact lettering you desire. We’ll create a custom stencil for you, and you’ll spend your evening sipping, snacking and dabbing paint onto your doormat. Paint Your Pet – Create a masterpiece from your favorite pet portrait! We print, silhouette and apply it to your canvas. Paint your own background to match your home decor, then begin creating your totally original pet masterpiece! Select a photo that truly captures the personality of your pet. We will silhouette (cut out) the background out of the photo you supply and focus just on your pet. Please try to select a photo that includes your pet’s entire body, or highlights just your pet’s head. These photos turn out the best. One Pet Only PLEASE, time does not allow you to focus on more than 1 pet. Come yourself, or invite a group of friends to come along with you and paint their own pets! Email a digital photo of your pet to: [email protected] at least 4 days prior to your event.. 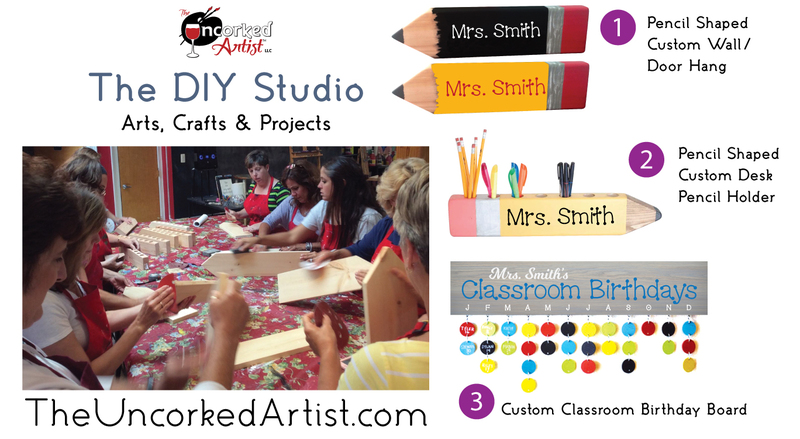 Custom Teacher Gifts – Create a truly one of a kind gift. Select your own paint and lettering colors.. Let us know which project you want and what custom lettering you desire. Build your own carrier – paint all of your pieces, stencil a custom phase, family name or even a sports logo. Then nail your carrier together.